Kaeng Musuman มัสมั่น A rich beef, chicken or lamb curry with peanuts. Not too spicy and often served at wedding parties. Coarsely chop the chilies and soak in water for 10 minutes. Drain. Dry-fry the cumin and coriander seeds, cardamom pods and cloves over medium heat for 1 to 2 minutes until they are aromatic and slightly browned. Pound in the following order: a) garlic, shallots and chilies b) coriander, cardamom pods, cumin, cloves and peppercorns c) lemon grass, galangal, bergamot, coriander roots. Place the shrimp paste on a piece of foil and cook it over a flame or burner for 1 to 2 minutes, or in a hot oven (425F) until the outside is slightly burnt. Mix the shrimp paste with all the above ingredients plus the sugar, salt and tamarind juice to form a fine paste. First, prepare the curry paste and coconut milk separately. Add the paste with some of the ‘cream’ from the coconut milk and heat until the oil starts to separate. Then, in a separate pan, heat peanut oil, garlic, galangal and lemon grass. Stir fry 1 minute until oil is aromatic. Add beef and stir fry 3 minutes until lightly browned and add the curry paste/coconut cream mixture. Add the rest of the coconut milk, lime zest, lime leaves, basil, fish sauce and chile paste, bring to a boil, and reduce heat. 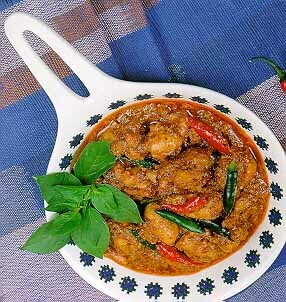 Kaeng Kari แกงกระหรี่ A mild flavored Indian type curry made with potatoes and chicken (sometimes other meats are used). Phanaeng Nua or Phanaeng Gai แพนงไก่ A spicy curry with either meat or chicken with coconut milk for flavor from southern Thailand. Kaeng Jut A mild flavored soup made of vegetables, tofu and shrimp, chicken or pork. Kaeng Jut Wun Sen The same as Kaeng Jut with the addition of Chinese vermicelli. Tom Yom ต้มยำ A hot and sour soup with lots of chilies and lemon grass and ginger. Can be made with chicken, shrimp, pork, beef, fish, or assorted seafood. Probably one of the best known Thai dishes. Khao Dom Rice soup, often eaten late at night, with pork, fish, or shrimp added. Kai Dom Hard boiled egg. Kai Dao Fried egg. Often added on the side with fried rice. Kai Chieo ไข่เจียว Plain Thai omelette. Kai Yatsai Thai omelette filled with meat or pork, onions and sugar peas. Khao Pat ข้าวผัด Fried rice. Mu Priow Wan Sweet and sour pork with vegetables. Phak Bung Phat Fried Thai morning glory leaves and stems. Often a fiery show. Nua Phat Nam Man Hoi เนื้อผัดน้ำมันหอย Fried beef with oyster flavored sauce and green onion. Dok Kalam Phat Mu (Kung, Gai, Nua) Fried pork, shrimp, chicken or beef with cauliflower. Gai Phat Met Mamuang ไก่ผัดเม็ดมะม่วงหิมพานต์ Chicken fried with green onions and cashew nuts. Mee Krop หมี่กรอบ Fried vermicelli noodles with bits of meat, shrimp or egg. Bo Bia Thot ปอเปี๊ยะทอด Fried egg roll containing bean sprouts with pork or crabmeat. Pla Thot ปลาทอด Fried fish (many types). Pla Thot Sam Rot ปลาทอดสามรส Fried fish with sweet and sour and hot sauce. Thotman Pla ทอดมันปลา or Thotman Gung ทอดมันกุ้ง Fried fish or shrimp cakes. Kai Chieo Khai Mot Daeng Thai omelette with fresh red ant eggs. Gai Yang Roasted chicken, from the Northeast. Best eaten with Som Tom and sticky rice. 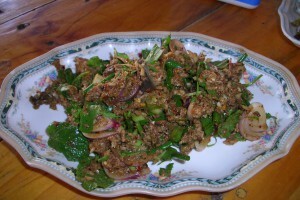 Lap ลาบ Spicy minced beef salad from the Northeast. 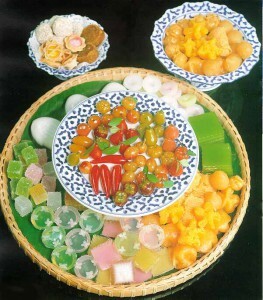 Eaten with sticky rice. with lots of chilies. These four dishes eaten together are a real event, even Bangkokians rave about Northeastern food. 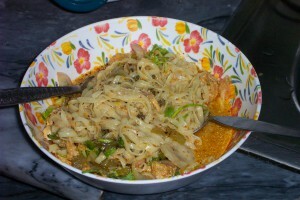 Khao Soi ข้าวซอย This is a Burmese influenced dish found mainly in northern Thailand. It is a soup-like dish made with egg noodles, pickled cabbage, shallots, lime, nam prik pao, and meat in a curry-like sauce containing coconut milk. The curry is similar to that of yellow or Masaman curries but is thinner. Broken fried noodles or broken fried won-ton skins are often added on top for a nice crunch. This is another of my absolutely favorite dishes but can be difficult to find, not only in Hua Hin, but all over Thailand. There are a couple of places in Hua Hin and a few oasis in Bangkok with decent servings but by far the best are found in Chiang Mai. 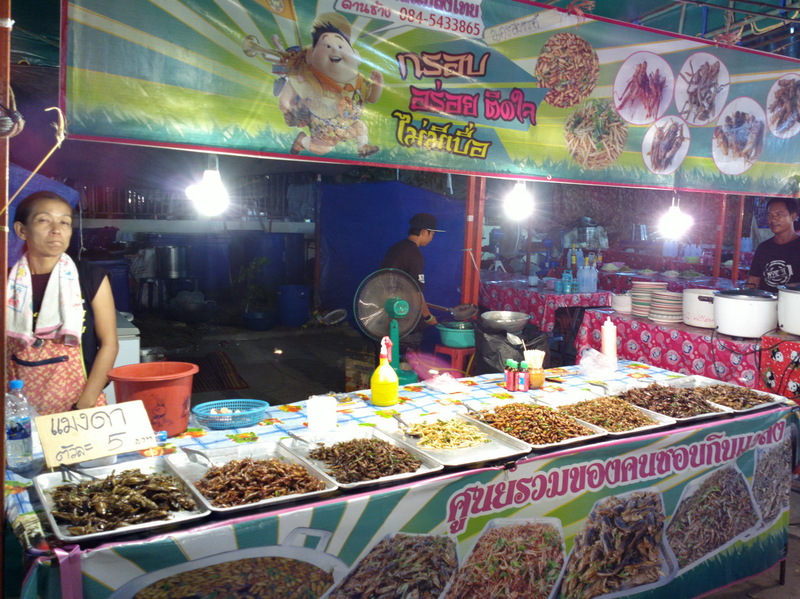 For Khao Soi lovers The Austin Bush Food Blog has a recipe and many posts on various Khao Soi shops in northern Thailand. Kung Thot Krop Crisp fried shrimp. Bo Bia Sot Egg roll containing bean sprouts with pork or crabmeat. Not fried. Kam Bu Thot Fried crab claws. Kam Bu Nung Steamed crab claws. Gai Op Bai Tuei ไก่ห่อใบเตย Baked marinated chicken wrapped in pandanus leaves. Ho Mok Pla ห่อหมกปลา Steam curried fish wrapped in banana leaves. Yam A spicy Thai-style salad with chilies, garlic, and specific additions like shrimp, beef ยำเนื้อ, squid, sausage, mussels, etc. 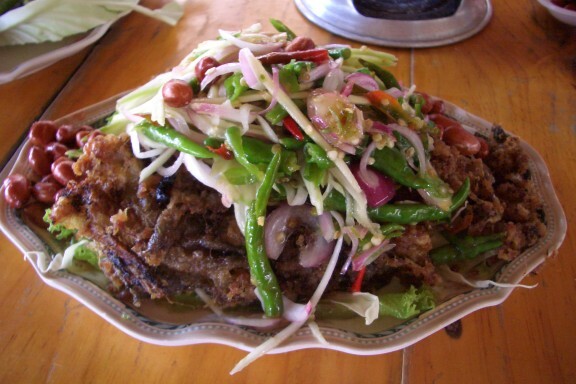 Yam Wun Sen ยำวุ้นเส้น Spicy Thai-type salad like the above but with Chinese vermicelli. Kung Op Wun Sen Baked shrimp with Chinese vermicelli. Nam Phrik Kapi Shrimp paste dip. Nua Daet Diow Dried beef, like beef jerky. Yam Pla Duk Fu ยำปลาดุกฟู A Yam is a spicy salad and this one features crispy catfish. This recipe now has a page of its own, here. For a another picture of a stand selling this dish, click here.